How sweet it is when a shoes speaks to your senses? Visually the right color, texturally lush to the touch and that new leather smell. Oliver Sweeney's Abrahams in navy give me all that. The navy is not too light or dark and will look perfect with indigo denim but not too blue to clash with other non-blue clothing items. The quality texture of suede and leather on this oxford is just on the money. It's a pretty good looking shoe in a nice color with an updated white sole making it a great shoe to hi-lo it up (or down) for the spring/summer. 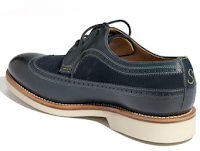 Available at OliverSweeney.com.